Visit photo essay on Storehouse – the link will appear below shortly…. LYING SOUTH-EAST OF GUADALCANAL at 10°36’S and 161°45’E between the Solomon Islands and Vanuatu, and north-east across the Coral Sea from Queensland, Australia, the island of Makira forms one of the Solomons archipelago. It is an island far from the well-travelled Pacific tourism routes, a place where cultural tradition is still strong and where the links between people and their food are short and direct. Much of what they eat, they catch or grow. 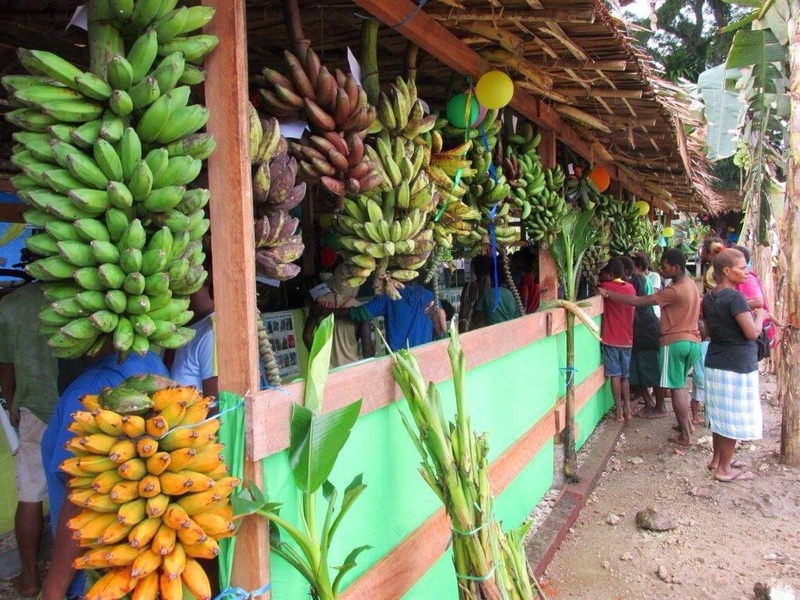 The Solomon Island development agency, the Kastom Garden Association (KGA) — Solomon Island Pijin for ‘customary gardening association’ — has for some time been involved in developing a collection of banana varieties on Makira. The idea of the collection — think of it as a banana bank — is that Makira farmers can obtain traditional varieties new to them and can also contribute their own banana varieties to the collection so that others can benefit. The collection’s purpose is to distribute varieties over a wider geographic area, ensuring they remain available as replacements after loss to cyclones or other events, and to broaden the nutritional availability of the plants. According to the KGA’s Rouhana Moses, over 40 varities are maintained in the Makira banana collection. “Kastom Gaden Association (KGA) has successfully participated in showcasing more than 40 varieties of banana during the recent Makira Banana Festival in Makira Province”, he writes. “The banana festival was part of the tourism promotion aimed at attracting visitors to Makira and to see the culture they have with this popular food crop, as it is part of their stable diet. The KGA set up a successful stall at the Makira Banana Festival. “Visitors to the KGA stall appreciated the effort made to collect these banana varieties”, said Rouhana. Banana products on display at the KGA stall included banana chips produced in Makira and medicine derived from banana to cure various sickness and diseases. There were talks throughout the three days of the festival on emerging issues such as climate change, food security and nutritional health. As well as for food, bananas are grown for fibre that is used for a number of purposes. In the Solomons as elsewhere, a distinction is made between those banana varieties eaten raw and cooking bananas, known as ‘plantains’ in some places. The place of origin — what’s known as the ‘centre of diversity’ — of bananas is placed in Papua New Guinea (PNG) where the fruit has been cultivated in some places from something like 8000 years. PNG is considered to be one of the birthplaces of agriculture. It is likely that a second centre of banana diversity developed in South East Asia at a later time. • with a metals recycling/small business development project in Papua New Guinea. Later, he joined with others to set up the consultancy, TerraCircle Inc, to continue the work started by APACE in the Solomons and elsewhere in the South West Pacific. TerraCircle continues to have a positive and ongoing association with Kastom Garden Association.